As I returned from the MakerFaire in San Mateo, California a few weeks ago, I was amazed at how this movement had grown to attract 150,000 people to one place for a weekend of “the greatest show and tell on earth. ” With all this enthusiasm, one can be forgiven for thinking that this is a new movement when, in fact, it has roots running back quite a few years. A quick search on Google Trends shows nothing before 2007, but this is simply not true. After writing earlier books on Logo for the MSX computers in the 1980’s, the Brazilian educational leader, Norma Godoy, decided , in 1992, to raise the bar on student programming by incorporating robotics into her currculum. Rather than just connect Logo to simple floor “turtles” that would move along based on Logo commands, she thought that the world of robotics was completely open, and that students should be allowed to build and program anything they wanted. Now before you say “Lego Mindstorms,” you need to know that product didn’t become available until 1998. And even if it had been available in Brazil, the high cost of Lego bricks meant that, once a project was completed, it had to be taken apart so others could use the bricks in their own designs. 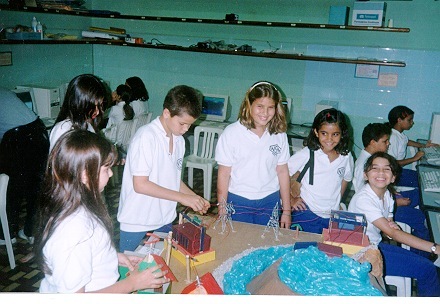 Rather than work with scarce and expensive materials, Norma decided to build her program around recycled materials – plastic soda bottles, cardboard, and other easily found items which were then assembled into projects containing motors and lights so they could be programmed by the student’s computer. This required a hardware interface to control these motors and lights. The interface she inspired engineers, (one at ORT and one at ARS Consult both in Brazil) to create, was connected to the parallel port (remember those?) of the computer with signals then sent to various outputs. Since cheap LEDs were not available at the time, small bulbs from Christmas lights were used. The most expensive parts were the stepper motors taken from dead hard drives, or purchased for a few dollars. Armed with this arsenal of tools, the key element was the creativity of the students who built amazing things. For example, one student built a model of a garage door opener that worked by flashing the car lights into a photosensor that then told the Logo program to open the door. The garage itself was made from a cardboard box, and a jar lid was used at the pivot for the door to open. One can only imagine what students would do today with inexpensive 3D printers being used to make custom gears and other parts that are hard to make from recycled materials! At one time, many thousands of students were using these materials throughout Brazil. and Norma started presenting her work at international conferences, such as the 1997 CUE conference in California. One of the teachers Norma taught led a team of students into the prize winning round of the First Robotics competition a few years ago. Now that companies are entering the educational robotics arena with kits that take advantage of recyced matrials, it is important to reflect on this rich history today. It is interesting to see the attention these new comanies get at educational conferences from teachers, some of whom were in school themselves when this robotics movement was started. When we look at these products, it gives us a chance to reflect on how student robotics is far from a new idea! In the spirit of full disclusre, Norma Godoy has been known as Norma Thornburg since 2000 and she and I are actively engaged in everything from 3D printing in the classroom http://amzn.to/1pyeaqk and soft circuits. Today, Apple CEO Tim Cook said the company plans to build some Mac computers in the U.S. for the first time in about a decade, investing $100 million in 2013 in an effort that could serve as a high-profile test of American manufacturing competitiveness. This is a brilliant move and it leads to a great idea on how to move our economic recovery into high gear. Imagine the US government saying they will only purchase U.S.-made products. If the populace wants to buy computers, for example, made in Taiwan, that is fine, but when it comes to purchases made with our tax dollars, the name and U.S. location of the factory where the products are made needs to be on the first page of every bid. No U.S. factory results in automatic rejection of the bid, independent of price. Now some might argue that making computers in the U.S. means they will cost more. Perhaps they will, and perhaps they won’t. But even if they do, the salaries are being paid to American workers who pay taxes and support our economy with their own purchases. Year 1 – products must be assembled in the U.S.
Year 2 – at least 50% of all components used in the products must be made here as well. Year 3 – everything, including all components, must be made in the U.S. I can imagine the cries of outrage from those invested in making things outside the country, but we need to help our trading partners know we are going through hard times and need to protect and rebuild our own economy at this time. That shouldn’t be too hard to grasp. Is there precedent for this? Sure. Look at Brazil (a country already undergoing strong economic growth) where the government is planning to use tablets in schools, a project which could require about 900,000 tablets by early 2013. President Dilma has made it clear that government-purchased tablets for schools need to be made in Brazil. This has resulted in a flurry of new manufacturing facilities being built, including those for Apple’s iPad. While it is true that the U.S. does not have plans to purchase a million tablets in preparation for a true country-wide rollout in education (another topic for another time), the purchasing power of our government is still strong enough to have a tremendous impact. If we want to kick-start a serious economic recovery in the U.S., we need to start by putting our workers first. What could be more American than that? Brazilians love their technology. I remember decades ago when I first visited the country to see that people would mark their seat at a buffet by leaving their cell phone on the table. In fact, Brazil was probably among the first country to have cell phones outnumber wired lines, although that was largely due to the difficulty of getting a new wired phone line at the time. But technological romance remains quite high. Our local shopping center’s Apple store is full of people. Samsung’s store in the same center is also quite busy. Even Nokia, whose future remains uncertain, gets some traffic – and this is not just window shopping! The number of iPhones, Galaxy tablets, and iPads coming out the door is amazing to see. In fact, a recent study by Accenture shows that Brazilians are three times more likely than the global average to be purchasing a tablet in 2012. This caught me by surprise given the explosive growth of this sector worldwide. While tablets are coming into US schools at a fairly good pace, some Brazilian schools are listing them as back to school accessories along with crayons and paper notebooks. The explosion is not restricted to the private schools. In Pernambuco (the state where I am in the northeast of the country) the government is purchasing 170,000 tablets in a pilot with second and third year high school students. Nationwide, other pilots in the public sector are adding 350,000 more tablets to the mix, with the goal to bring these devices to every student in the country. Now if tablets were cheap devices, this would be one thing, but they are not. The duty on imported electronics is so high that, for example, Apple products are nearly twice as expensive in Brazil compared with their price in the US. Of course, with the rapid growth in sales volume, Toshiba and other major players are opening Brazilian factories to avoid duties and thus bring the price down. The alpha-geek in me loves to see all this activity. I’m an avid and active tablet user myself. But when it comes to education, huge projects are taking a big risk if they are not thought out in advance. For example, what is the wireless telecommunications infrastructure of the school? Can it handle a thousand kids online at the same time? How will the tablets be used? If they are just glorified textbooks, much cheaper alternatives exist. If the uses are more in support of creativity and inquiry, what tools will the tablets have? Most importantly, how (and when) will teachers be provided not just with the mechanics of tablet use, but with the pedagogical support to transform education in rich ways? Without thinking these questions through, the huge influx of tablets will likely fail to effect permanent change. With the right support, though, we may see that the consumer driven romance with technology (especially among the young) will produce benefits that far exceed the cost of these devices, and this is a result worth seeking.